It seems like every time we turn around there’s another truck or SUV commercial touting a vehicle’s superiority both on and off road. Glitzy images of four-wheel slides across desert dirt roads, some surly stubble-laden driver in flannel and a gruff voice-over are all but obligatory, but where do the vehicle’s capabilities stop and the image of being tough and capable take over? There aren’t a whole lot of options out there that will stand up to serious off-road abuse on a daily basis, and there are even fewer that can do it while hauling a decent amount of cargo. While “toughâ€ may not be the first word that comes to mind when you think about Nissan, the company’s engineers have done an incredible job with their Frontier pickup, especially in its PRO-4X trim. The truck touts some serious off-road equipment, from skid plates to beefy axles, and the small wheel base and narrow track mean that it can get into – and out of – places that most can’t. If you’re looking for a ride that can take the rigors of the trail while being useful on a day-to-day basis, stop and take a look at the Frontier. This is a no-bones-about-it truck. The heavy-duty equipment underneath means you know it can take a serious beating without breaking a sweat, and the more than capable four-wheel drive system propels the vehicle through the worst mother nature can throw at it. The Frontier isn’t a full-size; meaning navigating through parking lots is as easy as piloting around fallen trees. The PRO-4X off-road package includes a set of Bilstein shocks that are made for the trail – and not much else. While the suspension handles itself over obstacles without a problem, it’s a little stiff for daily driving. The larger V6 engine, heavy four-wheel drive components and larger, more aggressive tires conspire against the Frontier in the fuel economy department as well. For a smaller truck, there’s plenty of room inside of the Frontier. Visibility is great thanks to an elevated stance, and the 4.0-liter V6 engine puts out plenty of oomph. On trail, the extra ponies and lots of low-end torque are fantastic, as is the truck’s electronic locking rear differential and super-grippy BF Goodrich tires. The whole package makes for a truck that’s difficult to get stuck in any situation. Unfortunately, all that works for the truck off road comes back to haunt it on pavement. The T/A Rugged Trail tires are noisy, the ride is stiff and the seats aren’t exactly La-Z-Boy material. Still, for short jaunts around town, the truck isn’t bad. The King Cab Frontier provides a decent six-foot bed for hauling just about anything, and the spray in bedliner that’s standard on the PRO-4X model ensures nothing harms the sheet metal. The Nissan Frontier PRO-4X is powered by a potent 4.0-liter V6 engine that produces 261 horsepower and 281 lb-ft of torque. You can opt for a six-speed manual transmission or a five-speed automatic. While a two-wheel drive version is available (and provides slightly better gas mileage), if we were going to suffer through the rugged ride, we would want the go-anywhere four-wheel drive system. The Frontier PRO-4X comes with a near-unbreakable Dana 44 rear axle when equipped with the manual transmission, and an electronically controlled two-speed differential (high and low speeds) in four-wheel drive trim. Much of this truck’s go-anywhere feel is thanks to the locking rear differential, standard in this trim level. The hardware allows both wheels to turn simultaneously to provide unbeatable traction in wet, slippery or uneven conditions. The truck also has respectable angles of approach, departure and break-over for tackling obstacles on the trail, and the Utili-Track tie down system is fantastic for keeping cargo stowed in the rear. For an extra $500, the PRO-4X Frontier can be equipped with a traction control package that includes hill descent assist. That option is only available with an automatic. The PRO-4X Frontier is available with a technology package that includes all of the goodies any self-respecting techie would want. Bluetooth hands-free calling, a kicking Rockford Fosgate sound system with a 6-disc CD changer, XM satellite radio and MP3 capability are all part of the mix. Those toys will set you back a mere $800, which is a steal in our book. This is no green machine. The sizeable V6 engine is thirsty compared to other mid-size trucks out there, and the heavy four-wheel drive components make the engine work, and drink, that much harder. The four-wheel drive Frontier delivers 15-mpg city, 19-mpg highway as a manual and 14-mpg city as an automatic. 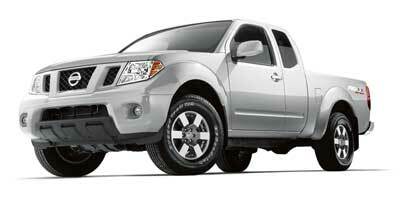 In two-wheel drive, automatic trim, the truck gets 15-mpg city and 20-mpg highway. The Frontier’s interior is no nonsense and well executed with good-looking materials everywhere you reach. The steering wheel is solid without being bulky, and while the dash utilizes plenty of hard plastics, it doesn’t feel cheap. The eight-way adjustable driver’s seat accommodates people of just about any size and makes the most of otherwise rigid seats. Outside, this truck wears a suit befitting its capabilities. The Frontier looks tough from just about every angle, with a sharp chrome grille up front and bulging fender flared down each side. The super aggressive BF Goodrich tires and beefy aluminum wheels make for a purposeful look. PRO-4X Frontier starts at $24,930 for the king cab, two-wheel drive, with the four door crew cab model bumping the price tag up to $26,280 for the two-wheel drive version. Four-wheel drive will bump each model up to $26,580 and $26,760, respectively. This puts the truck on par with off-road killers like the Jeep Wrangler at $20,205 and the Toyota FJ Cruiser at $23,320. The Nissan’s final bill also puts just ahead of small pickups like Ford’s Ranger FX4 Off Road at $22,820 and Toyota’s Double Cab Tundra at $23,500. As an off-road truck ready to take on whatever wooded trail you can throw at it, the Nissan PRO-4X Frontier is as good as you can ask for in a stock truck. Unlike the Jeep Wrangler or Toyota FJ Cruiser, the Frontier has a bed that can be used for everything from moving furniture to hauling tools – and to us, that’s a big plus. Put it on the pavement among the gas-sipping compacts and gleaming luxury cruisers lurking the downtown streets and the Frontier starts to feel somewhat out of place, as expected. That said, we think the price tag is well worth the bone-stock off-road capability, just know that the truck loses some of its civility in the switch from economical hauler to capable off-road rig.